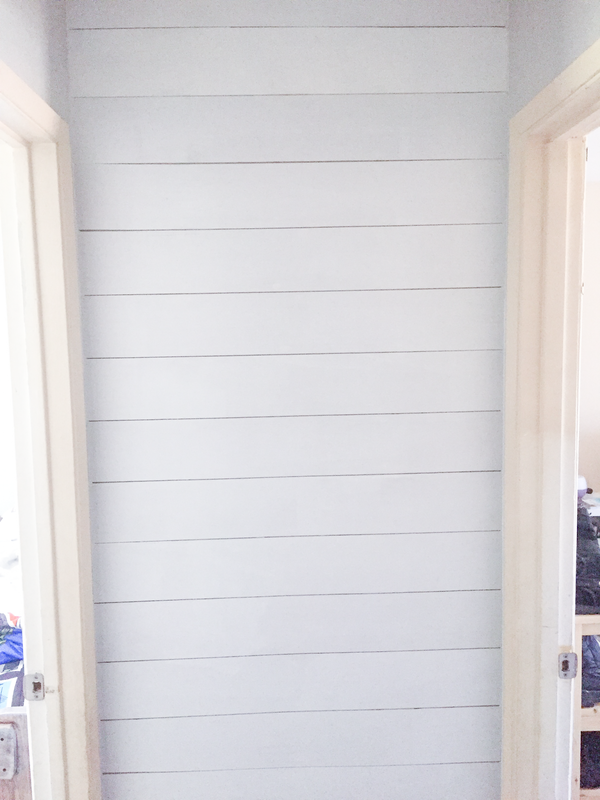 I know I may be a little late on the bandwagon on this one, but it took a LONG time to convince my husband that we should shiplap anything. If it were solely up to me, I would shiplap all the walls! 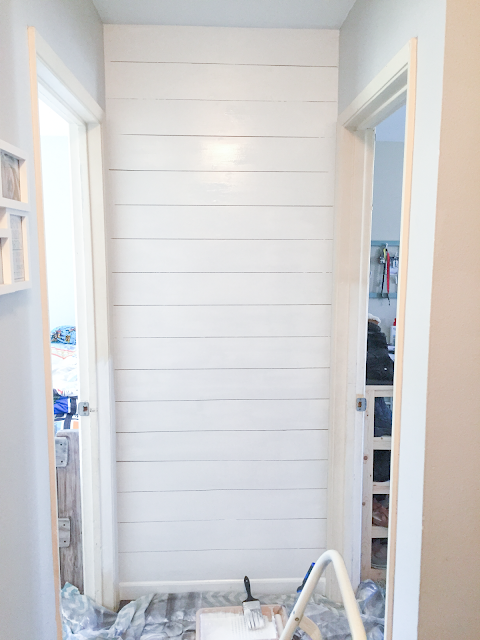 BUT, in order to try and convince my husband that we want to shiplap a few more of our walls, I tackled one of the smallest walls in our little home. Want to learn how to get this look? While doing some cleaning a few weeks ago, I found two Lowe's gift cards that my husband had stashed away in a bag he hadn't touched in over a year. I know he didn't know they were even in there, so I assumed they were now common gift cards (LOL) and I used some of the balance to pay for the materials for my shiplap. So, let's talk materials. The shiplap planks are expensive, and honestly, way out of my budget. So, I looked at the plywoods. Regular plywood is rough and would have required a lot of time and sanding (which I didn't have and wasn't willing to do quite frankly). When I found the underlayment pieces of plywood I knew that's what I would use. The underlayment is just under 1/4" in thickness but both sides are smooth and it is flexible. Best of all, it was only about $15 for a 4x8 foot sheet. YAY... wood? CHECK! Next up was the matter of cutting my wood. We obviously have a table saw in our tool arsenal, but my husband was going to be out of town and I really wanted to surprise him with it. Asking him to haul and cut my wood would totally have ruined that surprise, so that was out of the question. I went to Home Depot and talked to the worker who runs the saw there. He said they were only allowed to do 6 cuts (but I needed more than that). He was cutting wood for another customer, and wanted me to show him the wood I was talking about -- because he had no idea what underlayment was, hmmm -- and so I stood there with my little 4 year old waiting for him to finish with his customer. He would make a cut, and then walk away and come back with more wood. I could tell that woman he was helping was getting annoyed by her body language. I talked to her a little bit and she told me she wanted her plywood cut in half and it's been taking the worker an hour because he couldn't get the cut right. Ummm, okay, bye! Long story short.... do your recon and make sure if you want your hardware store to cut your wood for you, that the worker manning the giant saw knows what they are doing! Thankfully we live in between both a Home Depot and a Lowe's, so guess where we went next? Yup, my favorite home improvement store, Lowe's. It's my store of choice anyways, so I should have just gone there in the first place. (haha) My son and I walked in and went straight to the saw to find the worker. We didn't find them, BUT, we found one of the big carts with cut planks of underlayment on it! AHHHHH <----- cue the angelic choir. When I found the worker I literally said, I want that (and pointed to the cart)! He nicely explained to me that the woman who ordered it had come in yesterday to purchase the wood and was picking it up today. Okay, I could totally do that. So, I ended up coming back with my gift cards and purchased 3 sheets of underlayment. I had our small car so even though the worker offered to cut it right then for me, I still needed to come back to pick it up. I told him I wanted 5.5" wide planks cut and would be back in the morning to pick it up. And, that's what I did! So, if you are going to have your hardware store cut your planks, just go in a few days before you want to start your project and ask questions. Then you will be good to go! If you are NOT trying to surprise your husband with a planked wall, then feel free to use your own table saw. Step 1: Drag all four of your kiddos to Lowe's (including one with a fever -- who was a real trooper) to pick up your materials. I had everything but my wood already at home from other projects, so I only had to pick up my planks. When we got to Lowe's they were sitting there beautifully on the cart at the checkout. Step 2: Using a simple piece of sand paper, decide on which side of the wood you will be seeing and sand that side and the edges. I used a 220 grit sand paper because that's what I had on hand. The underlayment is already smooth, so you really will only need to sand the edges where it was cut. 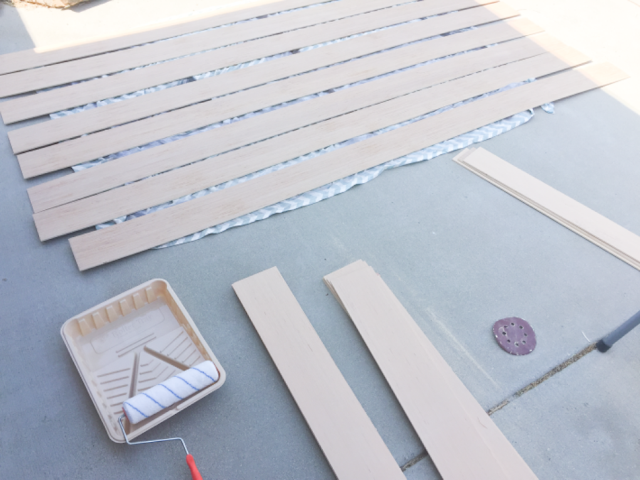 Step 3: Lay out a drop cloth, or old curtains in my case, and place your planks on top of it. I did the math and figured out how many planks I was going to need and laid out that many. I used a kilz primer to cover the planks. It took two light coats before I couldn't see the wood grain through the primer anymore. 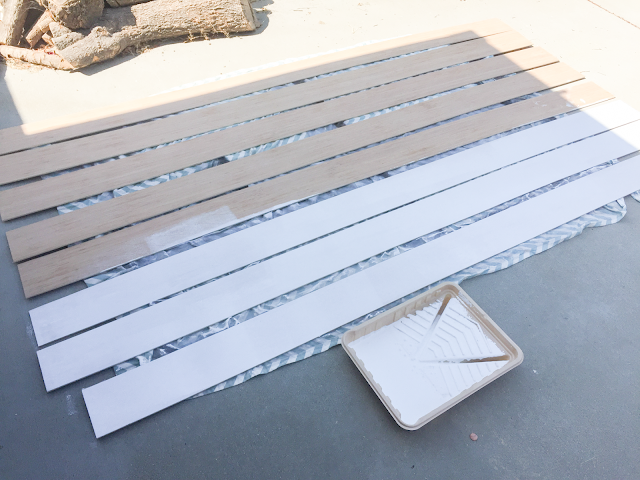 I painted outside with a roller and it took about an hour for the primer to dry thoroughly. Step 4: Set up. I grabbed a small level, my Ryobi Airtstrike 16 gauge brad nailer, brad nails, wood glue, a tape measure and a pencil. Once my wood had dried, I measure the width of my wall at the bottom above my baseboard. I used my stud finer to mark where the two studs were in my wall. 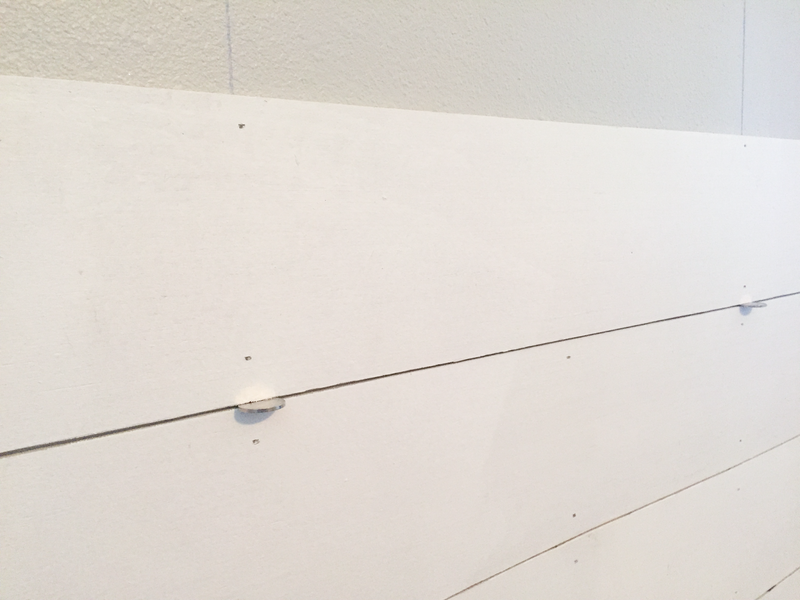 Than, I had my 9 year old help me to mark a chalk line on the wall for each stud from the ceiling to the baseboard. This is going to be my nailing line. Since I was using such thin wood, I did not remove my baseboards and just started the planks on top of it. Then I took the painted plank to my miter saw and made my cut. 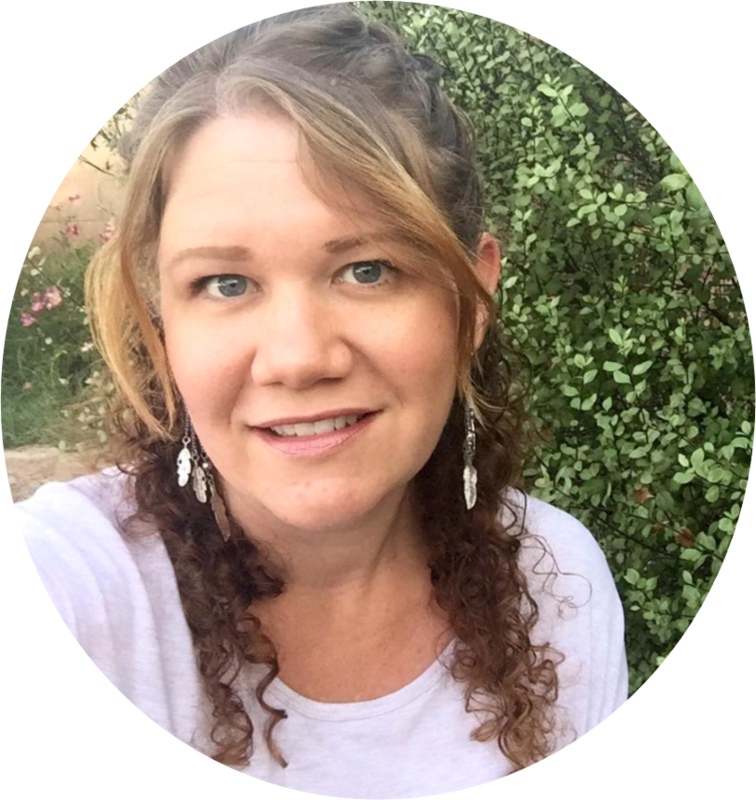 I always cut a little long -- you can always trim it, but you can't add more, right? 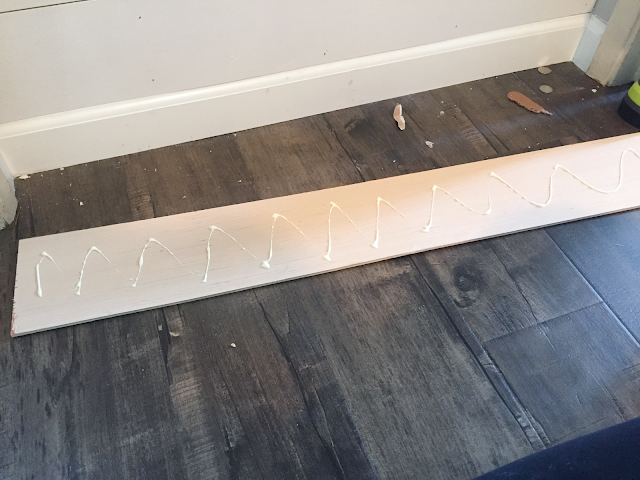 Step 5: I put a zig zag of wood glue on the back of my first board, pressed it onto my wall on the top edge of my baseboard and checked that it was level. Then using my nail gun, I nailed it in place along the two chalk lines, and then on each end. Step 6: For my second plank (and all the rest, except the last 2) I used two nickels as spacers. I was dealing with only a 35" wide space, so I was able to do this all on my own, if you have a larger space, make sure you have a buddy to help. This is my FAVORITE new tool. 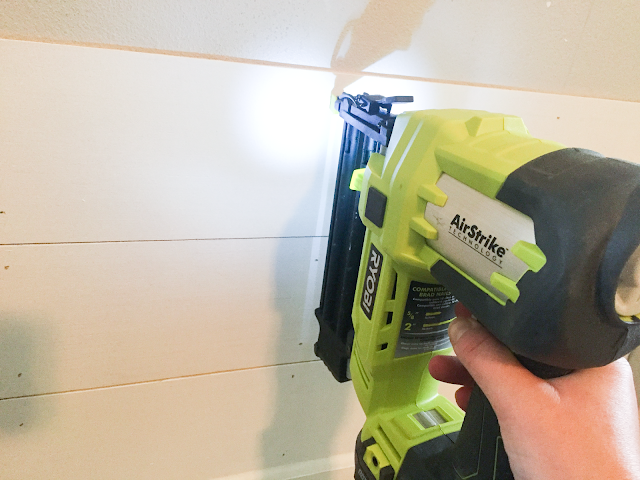 It's the Ryobi Airstirke 16 gauge brad nailer. It's available only at Home Depot, but seriously... it's worth the $$. Keep measuring and cutting your planks as you go... just in case your wall space isn't perfectly square. As you can see, I placed two brad nails on each chalk line into the studs, then two more on each of the ends. Here's how it looked after a few boards. 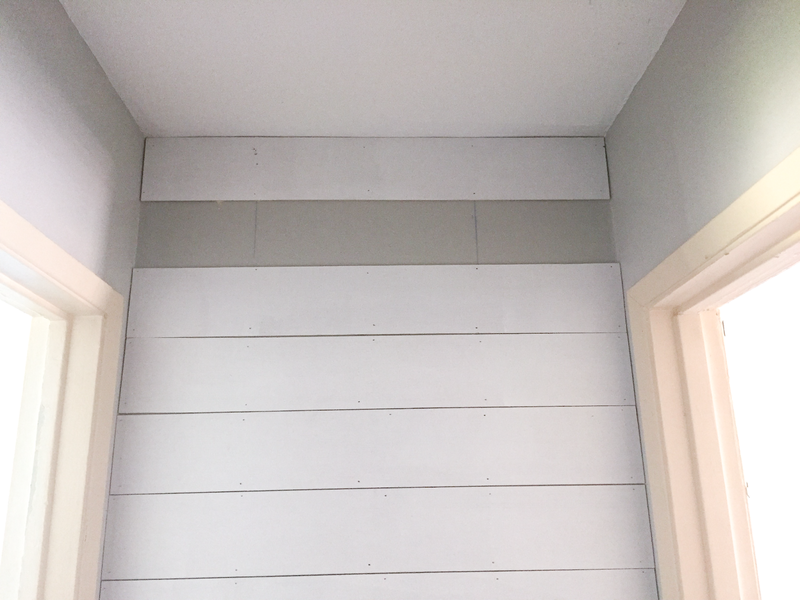 You can see how using the nickel spacers helps to add that tiny gap between boards giving it the look of real shiplap. The spacer also gives you the ability to correct the boards if they start to become a little off-level (<--- is that even a word? I don't know). After about every 3 boards I would check to make sure they were staying level and adjust as needed. I continued up the wall until I got to the last two planks. I TOTALLY lucked out that I didn't have to cut down any planks to make them fit. I did grab my jigsaw and ended up trimming down part of one long side of the plank by just a hair to get it to fit. After a quick sanding it was ready to pop in. I opted to put the trimmed piece in the open spot in the picture below because it was easier for me to put a whole piece at the ceiling and then trim another piece to fit. Step 7: Once all the planks are in, I caulked the edges. I am hoping eventually to shiplap the other walls in the hallway, so I didn't add any trim on just yet. 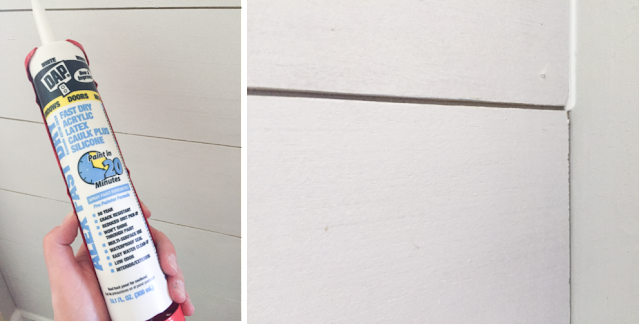 I use the DAP caulk from Lowe's (but I'm sure you can find it anywhere). Why do I use this one? It dries fast -- I hate waiting for things to dry -- and it's paintable. It was totally what I needed. 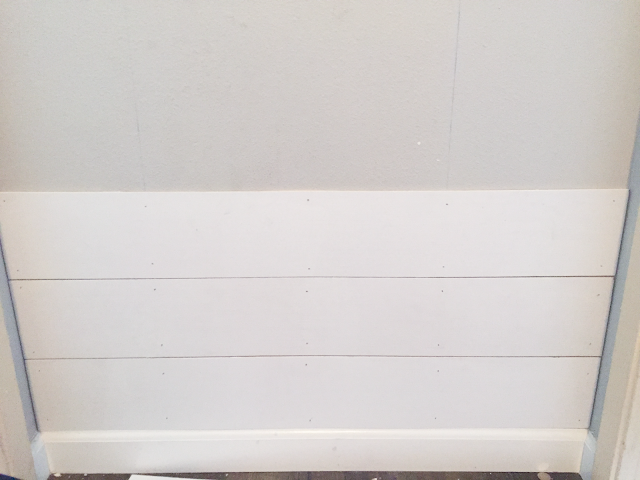 I simply ran a bead of the caulking down the edges where my shiplap planks met the other wall. Then with my fingers I lightly smoothed it out. I also did the ceiling. Then I took some simple spackle and filled in the nail holes. Once it dries, sand it down smooth and wipe away or vacumn any of the dust. 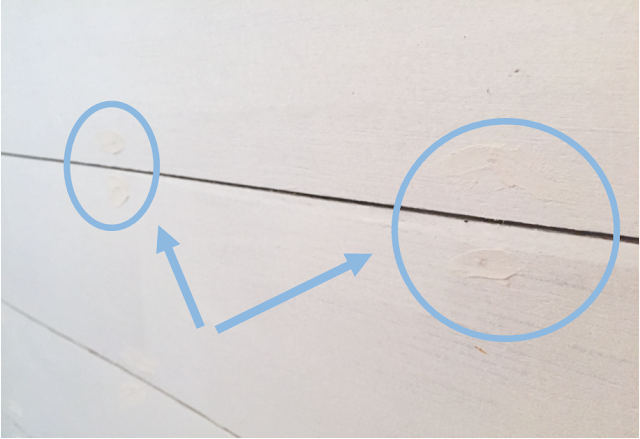 You can totally leave your nail holes exposed for a truly rustic look, but I preferred the clean simple look of filling them in. Here's how the wall looked with the caulking and the holes filled in. (Sorry for the bad iphone photo). Step 8: Paint. I just used the same white paint from my baseboards to paint my wall. I'm pretty sure it's just the white that comes in the can without any tint from it. But, it was left over when the people put in our flooring, so I'm not sure exactly what it is. 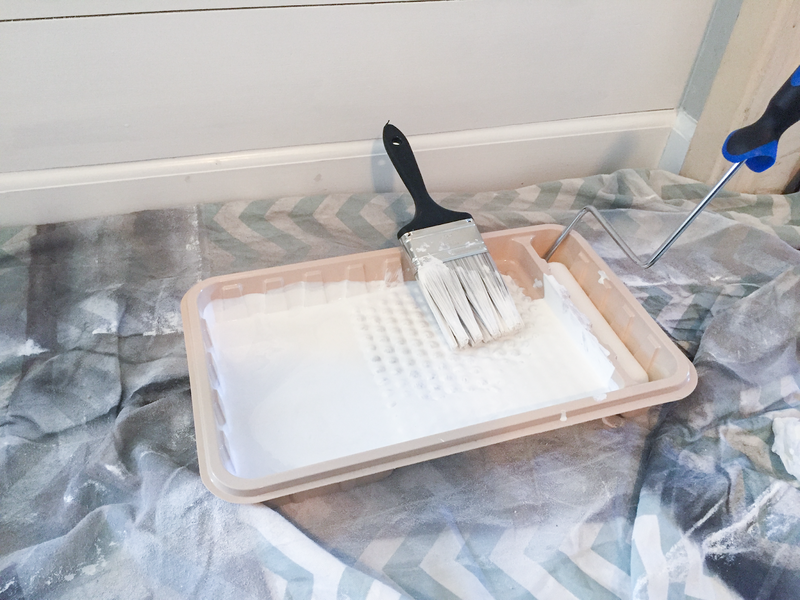 I thought I would use the roller, but it was way easier in my small space to just use a brush. Here is my freshly painted shiplap wall in all it's glory!! I ended up using a metal scraper to get any paint out from in between the planks. After I painted the wall, I got super ambitious and painted the doorways too... it's been on the to do list for a few years (sadly). Once it was dry, I decided to chalk paint my old mirror frame to help lighten up the space even more. (A tutorial for a different post.) I LOVE the way it turned out. Doesn't it look way better with the now WHITE door frames too!? 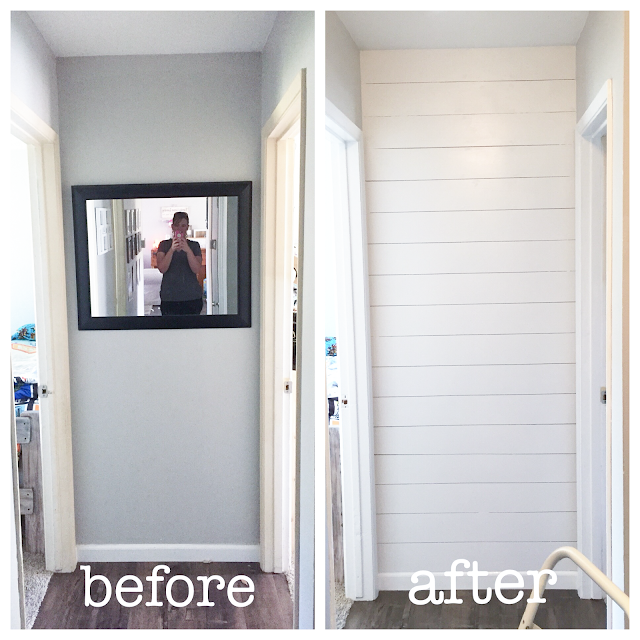 When my husband saw it he loved it and was amazed at how much brighter the one little wall of shiplap made to our drab/dark hallway. 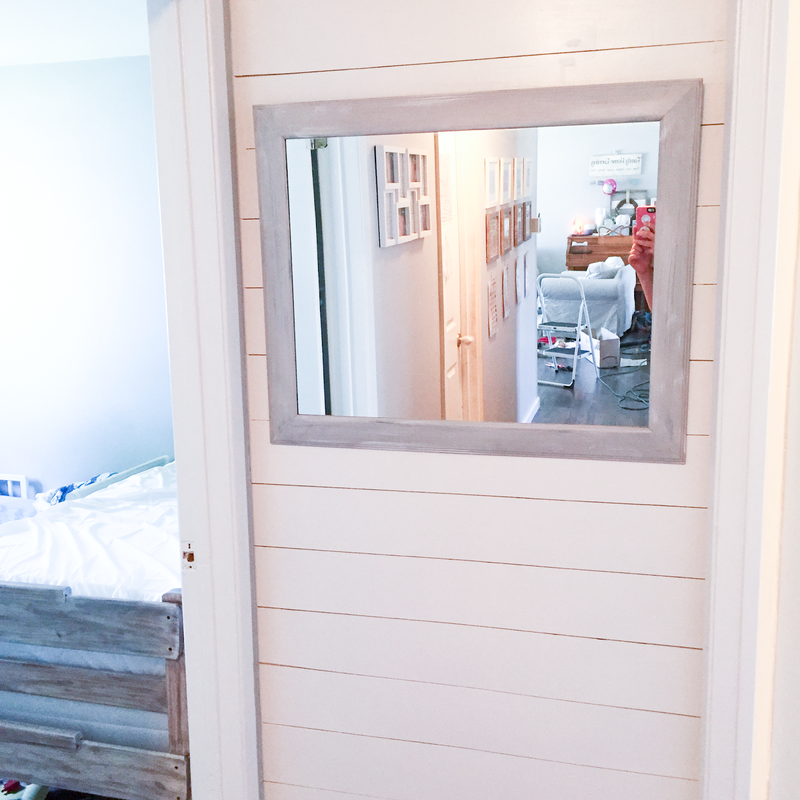 There may be more shiplap walls in our future, ha-ha! Here's a little reminder of the before and after. Amazing! Have you done any shiplap walls in your space? 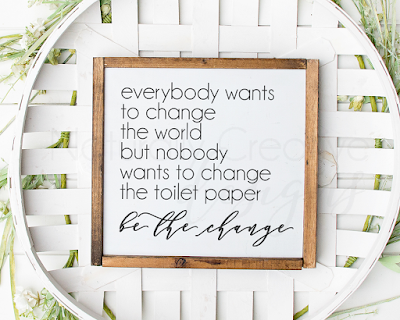 What did you use to create yours? If you haven't, what -- if any -- walls do you WANT to add shiplap to?